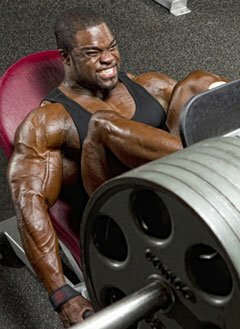 Brandon Curry is anything but weak, but like all bodybuilders he found a “weak” spot: his quads. That was then. Thanks to this workout, Brandon's wheels are now stronger than ever. Education: B.S., Exercise Physiology, Middle Tennessee State University (2006). Turned pro: Won overall and heavyweight classes at the 2008 NPC USA Championships. Pro resume: Placed 8th at the 2011 Olympia. Random fact: Never finished outside the Top-10 in his career. Without active quads, you can't do jack. If you want to run, jump, squat or walk, you need quality quads to extend your knee and propel you through your active lifestyle. The four exercises I'm about to drop target the four heads of the quadriceps for total development. The rectus femoris (the slab of muscle atop your thigh) also connects to the Ilium, which rotates your hips and helps lift your leg, so we'll make sure it's steel strong. You can work abs, biceps and chest all you please, but if you fail to train legs, you'll never win a bodybuilding contest. Nobody wants a car without wheels, no matter how sweet the chassis. My quads were my general weakness. Even when the rest of me was completely in-line, my quads held me back. This workout completed me. Neil Hill, my coach, introduced me to this quad workout. This session is based on his advanced Y3T program. You begin with pre-exhaust exercises and then launch yourself into the session with maximal quad stimulation. After the quads have been properly stimulated, you throw in the compound moves for complete overload on your already-fatigued muscles. Exercise 1 is pure torture. Your legs will burn like never before. This workout guarantees fatigue. The second exercise (dumbbell hack squats) seems simple and easy, but its reps-to-failure torch you. It becomes a serious challenge. Use a close stance when performing the exercise to target the outer sweep. The stance should be closer than you could ever use for back squat. yourself with this workout, it will take dedicated mental focus to retain your coordination through the final exercise. Keep moving during the workout; rest between sets should be limited. Start with a weight with which you hit failure around 12-15 reps, then reduce the weight by about 40% and try to complete another 12-15 reps. To finish the drop-set, lower the weight again by 40-50% and try to finish strong with 12-15 reps. Take a rest and repeat 2 more cycles for a total of 3 drop-sets. Once the last triple drop-set is complete return to the starting weight for partials, with no rest. Use a close stance and put the dumbbells out in front as a counter-balance. Keep your back straight and drop into the hole, as if sitting upright in a chair, coming up only as high to cause constant tension. Rest pause is used until you reach complete failure. Elevate heels with plates for this movement. Push to failure using rest pause until complete failure. Repeat this for 4 sets using constant tension range of motion. Take a lunge step onto the edge of a bench. Keep your torso upright and shift your weight to that leg, then push away and switch legs.